Biennial plant. The root is fibrous, branched, sometimes at base thickened. Stems (25) 30 - 50 (70) cm tall, single, rarely 2 - 3 or more, upright, single or branched in the upper half, bare or at the base mostly scattered short fibrous, sometimes in the lower half pale to dark violet. The basal leaves oblong shovel-like or broadly lance, gradually narrowed in the narrowly winged stem, bare or predominantly on the upper surface scattered shortly bristle, the bristles 0.3 - 0.5 mm; stem leaves lance to narrowly lance, 25 - 50 mm long, 2 - 4 (5) mm wide, shallowly rounded jagged, or almost entire, upper linear lance, shorter, sitting down. Inflorescence top, like a broom, with 3 - 10, rarely more blossoms. The calyx shares linearly lance, tapered, more or less remote from the crown, at the edges with 1 to 2 short teeth, 10 - 18 mm long, with the fruit extended, up to 2.5 times longer than the box. The crown is broadly funnel, (15) 18 - 45 mm long, blue or pale blue, inside with long silky hairs. The anthers on short, long silk fibrous stems. The box upright, elongated conical, naked, (6) 8 - 12 mm long, with 10 protruding veins. The seeds are elliptical, 0.5 - 0.8mm long, pale brown to dark brown, with a smooth glossy surface, sometimes with a barely noticeable fine pattern of brown reddish lines. Subsp. patula. The crown (15) 18 - 25 (30) mm long; calyx shares 10 - 16 mm. Widespread within the species. Subsp. alekovyi Ančev, Год. Соф. Унив. 85 (2) (1994) 196; C. hemschinica auct. fl. bulg., non C. Koch. Crown 25 - 45 mm long; calyx shares 12 - 18 mm long. Western and Central Stara Planina, from 1400 to 2100 m altitude. Holotypus. Mt Stara planina pars media, pr. refugium Dermankaja, 1500 m, 21.7.1990, M. Ančhev (SOM 142835!). Note. 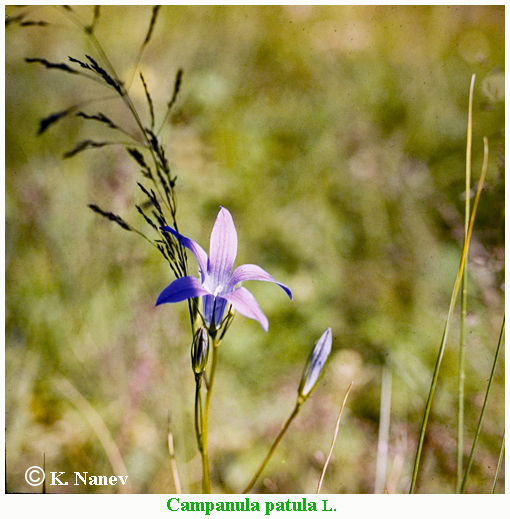 The species of C. patula combines morphologically close species, which in the Balkan Peninsula have partially sympathetic areas. Good diagnostic features are the condition and length of the stems, the presence of short sheds at the base of the stem in C. abietina, the formation of tufts from numerous ascending stems in C. epigaea. The three species of C. patula, C. abietina and C. epigaea in Bulgaria are spread in the mountains, mainly adhering to the habitats located in the beech and coniferous vegetation belt, more rarely entering the sub-alpine vegetation belt (C. abietina). 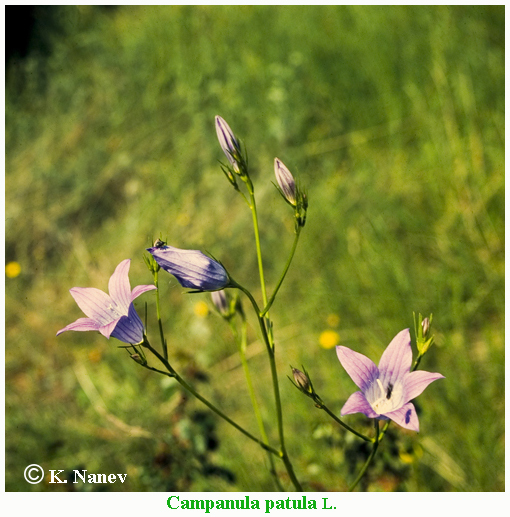 S. patula is more closely related to the medium European mesophilic flora. Nearly morphologically to this species are the rounds of C. hemschinica S. Koch and C. olympica Boiss., Distributed in the Caucasus and mainly in the northern mountainous areas of Asia Minor, the links of these two species with C. patula remain unclear . Campanula patula or spreading bellflower is a plant species of the genus Campanula. It can grow to more than half a meter high. This delicate bellflower bears lateral branches of pale blue or white flowers that are upright and funnel shaped. The leaves are narrow and pointed. Branches are often supported by the surrounding vegetation, so the plants can appear prostrate. The main difference between this and other bellflowers is that the petals in the bell are spread out and more pointed and this gives this species its common name. Spreading bellflower is a biennial herbaceous plant growing to a height of 25 to 80 centimetres (9.8 to 31.5 in). The stem is branched, erect and wiry and often reddish near the base. In its first year, this plant produces a rosette of short-stalked, slender, spatulate leaves. In the second year it sends up one or more flowering stalks. The leaves on these are alternate, linear and unstalked, the margins having rounded teeth. The inflorescence is a few-flowered terminal raceme. The calyx is fused and has five triangular lobes, sharp tipped and spreading. The corolla is five-lobed, 20 to 25 mm (0.8 to 1.0 in) long with five violet-blue (or occasionally white) fused petals. The corolla lobes are longer than they are wide. There are five stamens and a pistil formed from three fused carpels. The fruit is a strongly-veined, conical capsule. The flowering period is from June to September. Spreading bellflower is native to temperate parts of Europe and widely naturalised elsewhere. Its natural habitat is meadows, banks, open woodland, clearings, roadside verges, fallow fields and waste ground. In the United Kingdom it is rare in the wild, occurring mainly on infertile banks and rock outcrops. It needs light for the seeds to germinate so may reappear after many years of absence when the soil is disturbed. A bellflower weevil Miarus sp. is associated with this plant. Flowering Time: Blooms: VI - VII (VIII), fruitful: VII - X. Distribution in Bulgaria: Grow in mountain pastures and meadows, less often on the edge of forests and in the settlements, on well-developed or shallow mountain-meadow soils, on silicate rock basis, from oak to coniferous belt, often in communities of Picea abies, Pinus sylvestris, Juniperus communis subsp. alpina, Bruckenthalia spiculifolia, Chamaecytisus spp., Vaccinium myrtillus and others. (Vitosha, Lyulin), West Border Mountains (Osogovska mountain, Vlahina mountain), Belasitsa, Pirin, Rila, Western and Central Rhodopes, from (500) 700 to 1700 m altitude. (Conspectus of the Bulgarian Vascular Flora) = conspectus&gs_l= Zlc. Distribution: Europe, more limited in the northwestern and southern regions.